New potatoes: those ineffably delicate-as-butter spud nuggets pulled out of the ground in pre-adolescent condition, before their skins have even been able to form completely. 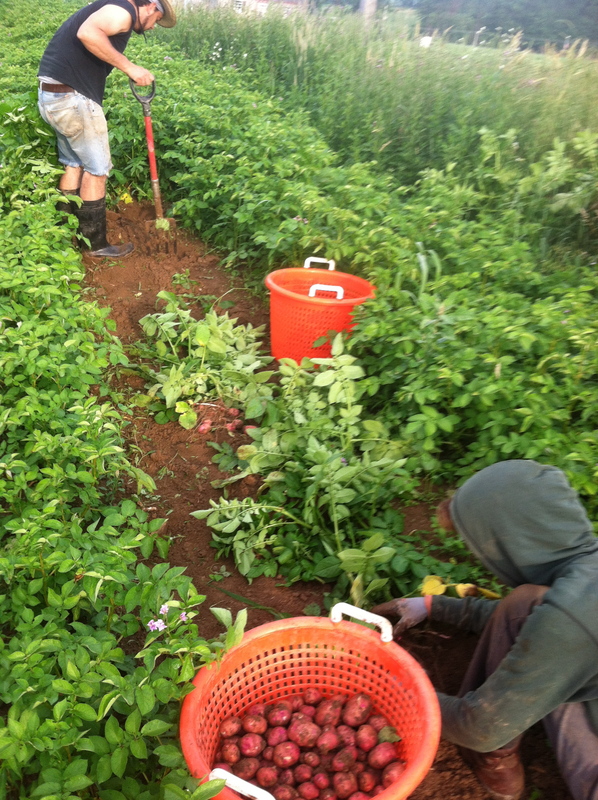 Here are Mario and Chris forking out red-gold new potatoes for this week’s share. While marching around the grounds, offering my two cents to Chris and Mario as they toiled away, I quickly became aware that I was not the only pest in the potato field. The dreaded Colorado potato beetle had found us. It does not take long for a phalanx of these slimy orange creatures to reduce a field of potatoes to leafless stems. So oozy and disgusting are they that even the most organic of growers will feel an urge to unleash an arsenal of chemicals aimed at saving the spud. Well, there are chemicals acceptable to organic standards that some farmers use on the potato beetle. There is even a GMO potato with an organic pesticide, Bacillus Thuringiensis (BT), genetically inserted into the cells of the potato plant. 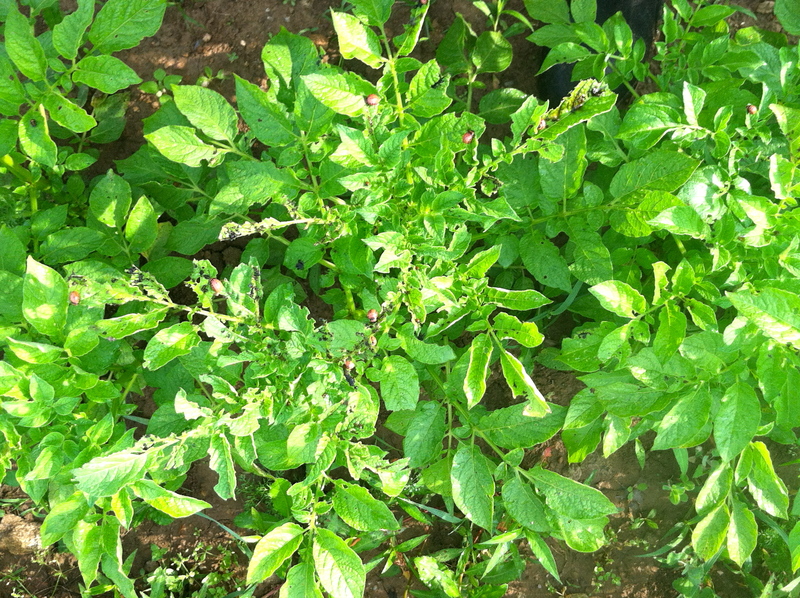 The potato beetle takes one bite out of the plant and drops dead. The savvy consumer is left with the question: What happens when I take a bite out of the same plant? So I wish I could impress you with my own patented super sophisticated organic technique for doing away with this icky pest but I am sorry to inform you that my methods are a little more uh…shall we say…cave man-like. In the past, I would wade through the potato field and squish the little buggers between my thumb and forefinger until my hands were stained a sickly yellow. This method is a throwback to my gardening days, when the potato section of my garden consisted of a couple dozen plants. As my potato patch grew larger over the years and I began to hire employees I found that squishing Colorado Potato Beetles between thumb and forefinger was one job the help unanimously refused to do at Eckerton Hill Farm. So I spent hours and hours squishing the little buggers and dropping them amidst the growing potatoes. This year, as the potato patch has grown to one full acre, I have settled upon a new tactic. From the sink, I snagged a spent strawberry yogurt container, drying yogurt still adhering to its sides. Then I began knocking potato beetles live into the yogurt container. Many years ago, when the rose garden would become infested with Japanese Beetles, we used to put gasoline into a glass container and then fill the container up with Japanese Beetles, which magnified like splendid metallic gems as they drowsed permanently in the fumes behind the glass. Gas was cheap back then, I guess. No way I was going to enlist petroleum in my so-called sustainable methods. To pick all of the potato beetles off my plants took me as long as it took Mario and Chris to fork out all of the new potatoes for this week’s share. I was left with quite a stash of live Colorado Potato Beetles. What to do with my Colorado Potato Beetles? It did cross my mind that I could include the affable critters in this week’s share. Live yogurt coated potato beetles? The chefs in New York City pay mucho dinero for a delicacy like this one. And here we are offering it to our valued CSA members…. OK, ok. Time for a Plan B. “Why not feed them to the chickens?” suggested Jessi, which made me think of the potato beetles’ vibrant orange color and how the same beetles ingested by our layer hens might make for some downright neon yolks in the frying pan. So into a feed bowl went my pests. But alas! Our hens nibbled on a few of them and then lost interest. So over to the pigs they went, where the pigs trampelled more of the beetles than they actually snorted up. 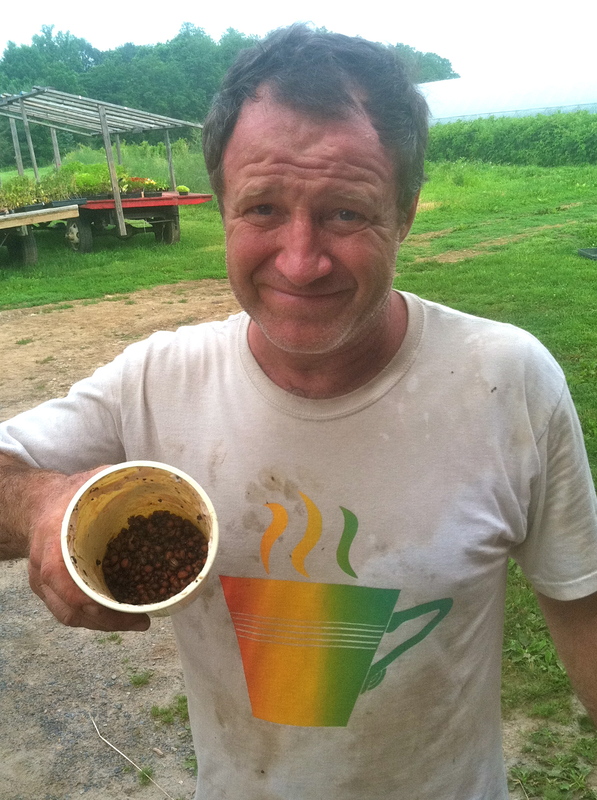 Not one to give up easily – after all I have been farming for 18 years — I decided to try and enhance the flavor of the Colorado Potato Beetles for the palates of my most discriminating hens. In fact I kicked off my own cooking show for the benefit of those hens, which you can view at the bottom of this post. If only I could speak with Julia Child’s accent, maybe I could convince those hens…. Sorry, no potato beetles in this week’s share. Nothing’s so rare as a day in June…..